This stir-fry dish has it all: chicken, vegetable and a great sauce, plus it can be made ready in just 20 minutes. and cook until golden brown and full cooked, about 5-6 minutes. Remove to a bowl. cover with aluminum foil and to steam the vegetables for 4 minutes until tender. with a bit of sugar or soy sauce as needed. 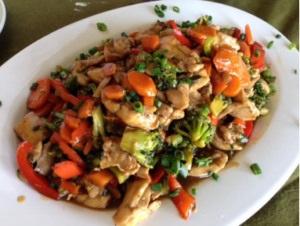 Serve stirfry topped with green onions.